Senators Used Talking Stick for Dialogue and So Can You. Here's How. - RiverhouseePress Senators Used Talking Stick for Dialogue and So Can You. Here's How. Big News – A Moment of Dialogue in Washington! Divided Democrats and Republicans found a way to talk this week, and actually listened to each other, using a talking stick! The Washington Post on January 28, 2017 reports that Senator Susan Collins of Maine, one of the few remaining moderate Republicans, convened a bipartisan meeting in her office to explore ways to reopen the government during the recent shutdown. Having succeeded at that, they’re now discussing a way forward on immigration issues. They used a Masai talking stick to structure their conversation. So What’s a Talking Stick? A talking stick – this one borrowed from the renowned cattleherders of Kenya – is an object passed around as people talk, to provide a simple structure of respectful communication. 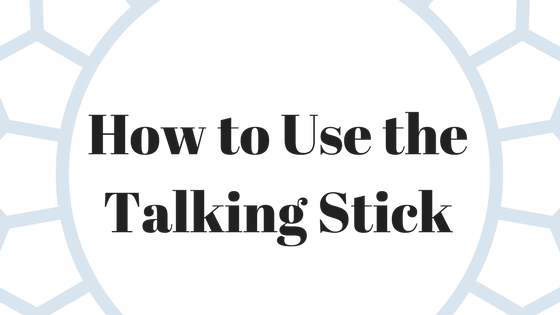 There’s one ground rule: You can’t speak unless you’re holding the talking stick. 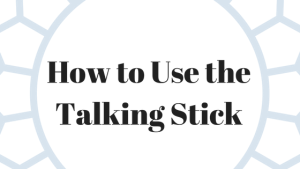 The simplest of all tools for facilitating dialogue, the talking stick requires no great expertise or training. No special equipment required. Any simple object will do – a feather, a stone, a pencil, a paperweight. Usually a talking stick is used with people sitting in a circle, and it’s simply passed around the circle, from one person to the next. I’ve also had success with it in larger settings where people are not in a circle. In this case it can be simply passed back through the group to those wanting to speak, or the facilitator can move around the room and reclaim it after each speaker. 1) Make sure the ground rule is clearly understood and supported by all. 2) Model and require respect for the stick. Model giving full attention to the person holding it and do not interrupt. Be alert to any violations of the ground rule. When this happens, promptly repeat the ground rule and remind the group that keeping it is essential. If you ignore violations without saying anything, they will multiply and the structure will be lost. Cleanly facilitated, a talking stick quickly brings a tangible sense of order and deep listening into the room. People hold forth and then a few seconds of spacious, uncontested quietness reigns as the object is passed to the next person. As facilitator, you can invite such spaces by holding the object thoughtfully in your own hands for a few seconds of silence at well-chosen moments, such as just before you pass it to the first speaker. As a tool for structuring dialogue, the talking stick can be almost magical. But recognize its limits. It’s a dialogue tool and unwieldy in moments of negotiation or decisionmaking. Think through the purpose of the session. If eventually you must go beyond dialogue – as usually you must at some point – think through options and how to transition when the time arrives. You can easily find detailed guidance with a web search. Or get my book Cool Tools for Hot Topics: Group Tools to Facilitate Meetings When Things are Hot, with more than twenty practical tools for facilitating dialogue in difficult settings, including the talking stick. At $4.95 on Amazon it won’t break your piggy bank!